Thank you, I have moved a little further, but this topic does not mention the first error that occurred - the test card did not find the path to the game. The path that is specified shows the remote folder - I placed the editor of the dune in a completely different way. So how to fix it, I do not understand. On your editor open the file d2keditor.ini (with wordpad or any text editor); there is a section called "[Paths]". There will appear some lines, if they are wrong you need to write the path where you have the game. In my case I have it this way. That's the route the editor will try to execute the game; probably you have the game in a folder but the editor has a different path. Check the other three lines too. I am going to copy-paste what I have on my .ini for reference. Maybe the last line, "missionspath" don't appear on your .ini; but don't worry about that. I think this line appears to me now that I downloaded the .exe provided in this post and after executing the line it's created. Thank you again, I do not have this problem right now. But there is another problem. I hope this is the last problem and I will not waste your time anymore. And just in case, try to save your map; just any name and then try the test option; maybe that trigger another error with more info. And the editor really began (probably) to see the game. But the next error is caused already incomprehensibly from what. lol I myself did not understand how, but I corrected this error. I temporarily deleted the file with my own paths, because I noticed that after closing the program, if this file does not exist, it is automatically added with automatic settings. Apparently, I just needed to delete this file and restart the editor. But there the paths were still written with an error, which I corrected. After that, the game started. Thanks for the help. Oh, right; if the .ini doesn't exist the editor create a new one. I did it once but since the program had the wrong paths I forgot about this "solution". Maybe while you were editing to write the correct path you place any letter/number somewhere "breaking" any of the .ini lines. Anyway; I am glad that after letting the editor to create a new fresh file fixed the problem (even if the path was wrong). Have fun doing stuff! from "config\tilesets.ini". All tileset .ini files must now contain name of attributes file. The major improvement in this update is much easier work with custom tilesets. First, it is no longer needed to specify all your tilesets in editor's tileset.ini file, but instead you can just place your tileset's .ini file into tilesets folder and editor will automatically load them. Second, the editor can now directly load the tilesets in game's internal formats (.R8 and .R16)! That means no longer need to distribute those heavy .bmp files along with the editor and your custom tileset packs. (Do you remember Shai Hulud and its "Tileset extractor" thing which actually did not work properly? D2kEditor can load .R8 and .R16 files fast on the fly, and it's written in just about 30 lines od source code!). The editor first looks into game's Data folder and attempts to load .R16 first, then tries .R8 if .R16 is not present. If not found in game's folder, looks into editor's tilesets folder for .R16 or .R8, and finally tries to load for a .bmp file (i.e. BLOXBGBS.BMP, without "d2k_" prefix). As of the attribute file (TILEATR*.BIN), editor first attempts to load it from editor's tilesets folder, then looks for it in game's Data\bin folder. Note that you still need to create special TILEATR file with editor's additional attributes, otherwise editing will not work properly (i.e. it won't bo possible to draw sand, rock, dunes etc.). If you want to use a new custom tileset with the editor right away, all you must do is to copy all files into game folder, and copy tileset's ini and TILEATR file into editor's tilesets folder (if the author didn't provide those, just copy template.BIN, name it according to tileset name, and edit attribute file name on the second line). Another improvement is easier use of the editor for the first-time users. That means just download the editor, unpack it into any location on your computer, load a map from the game's maps or Missions folder, and everything will be ready and configured! And the editor should also support the case when missions are stored in Data\Missions folder. No longer need to edit or fix anything in D2kEditor.ini file manually. I would really like to ask you for thorough testing of everything what I described here, if it really works and there isn't any bug, a flaw, or an overlook. I tried hard to tune up the program and address most of the problems people complained of here on the forum. Also I do not have multiple monitors on my computer, so I could not really properly test the check for window being displayed off-screen, so please somebody who has multiple monitors, test this and let me know if program works well on multi-monitor setup. Also this is going to be the last pre-release version, as I'm going to publish official 1.3 release soon and ask for putting it on D2K+ site for download. So this is the last chance for any bug reports or feature/improvement suggestions! I also got a suggestion. On a 4k screen the pixels are so small that old programs/games need to be scaled up. This scaling causes some tiles to show more pattern and 'color-patches'. People are good at seeing patterns and so I started to notice duplicate tiles (like 2 or 3 next to each other) which is not pretty. With the random tile paint tool (in your program) there is still a change of double/triple tiles in close proximity. So my solution to this is very simple. I analyzed all maps (Campaign and multiplayer) to look at the tile distribution. I used this distribution to random drop tiles but also reject doubles (horizontal, vertical and diagonal). I have generated a 128x128 map with this "super random" ROCK tiles and one with SAND and attached those to this post. Heh, that's really nice analysis, I was never actually thinking of that. Althrough it's quite interesting suggestion, unfortunately I did not implement this, because I just didn't find it beneficial enough to be worth implementing it (in other words I didn't feel like doing it). For me the random tile placement editor uses is just good enough, but I'm not against adding this feature at some point. Alright, I already love the recent files, I can even open maps from other folders quickly. Also I really like the "mark event" yellow thing on the condition type. Speaking of which: Would be too much extra work to be able to change the order of the condition type section. Right now the "event type" panel already can be reorder with the rev-pag up-pag buttoms, and on the condition type if I delete any line here the others gets reupdated with the new numbers (even for flags); so, being able to order that part would be a good addition, if possible. I am working on a campaign right now, so I am going to use it ofter and if I find any other bug I wil tell you. Also calling for @Fey, he it's finishing a custom tileset right now, so he is the best to try that part of the editor. You awesome SoB, that conditions update is exactly what a lot of us needed. In the third link for test maps, that contains the latest update, which I don't foresee receiving any more changes. Anyway, I'll check this out at the earliest opportunity. Many thanks for continuing to work on this, Klofkac! And, uhh... I don't suppose you have any advice for giving special characteristics to new tilesets, do you? I tried adding editor map attributes in the tile attributes editor, but it just messed up the tile attributes altogether. Thank you for the update Klofkac. I tested with my multi-monitor set and the program now nicely goes to the main monitor if the other one is disabled. I dragged a map into the program and it beautifully got the correct tileset. Did a Test>Quick launch and it work flawlessly. Awesome! When I got some time I will do more map analysis for fun, perhaps it will show some interesting connections or nothing, haha. edit: I did notice one small thing. The colors are different in your program compared to the game. See image below. I found a small bug, just a minor visual bug. To replicate, set X amount of events, attach a specific condition to the one af the bottom, then when you delete others from the top, the cells on the position and player still contain the color. moving the cursor/mouse over those lines or closing and opening the windown fixes the problem, so it's something harmless. Edit: not sure if it is a bug or not, but your editor now trigger 1 error while I was trying to drag the map file from a folder into the editor. The map load's in white (with a few buildings at first sight) and if you move around the whole screen gets filled with turrets, walls and other random things. After accepting the error, if I choose the tileset called "BLOXBGBS" the editor works fine, so my guess here it's the owner created the map where the file it's writteng in lowercase meanwhile the one I have it's in uppercase. As soon as I hit "save map" and try again the error don't trigger, so probably it's just a "lowercase/uppercase" type of problem. This don't happen if I use older versions of your .exe (and I have all the exes together, just with different names). This error also trigger with the map from Fey, the one that make use of a new custom tileset; although it's normal (since this specific custom tileset doesn't exist), your older editor can just open the default map applying the default BLOXBGBS tileset. So: an uppercase/lowercase problem, but also if a tileset don't ever exist maybe would be good to load the default BLOXBGBS just as a failsafe (just as happen on all the previous versions). I can try to improve that. I don't suppose you have any advice for giving special characteristics to new tilesets, do you? I tried adding editor map attributes in the tile attributes editor, but it just messed up the tile attributes altogether. Hmm, there should be no problem with the Tileset attributes editor to add editor-specific attributes. I did that myself when preparing the original tilesets. Can you try again or explain how it messes up? One more thing. You can actually do lot of cool and magic things with tileset ini file. This is exactly made for better work custom tilesets in the editor. Here you can define minimap colors, give custom names to terrain types, define presets for terrain blocks etc. Under tilesets folder there is "template.ini" file which you can use, and where all the things are explained. Heh. Actually I did not notice myself. Cannot say what is the reason for that. But I don't consider this to be any serious problem and I'll probably just leave it. You are right, this is caused by tileset name written in lowercase, and when program looks for the tileset in available tileset list, it won't find it because "Bloxbxbs" is not equal to "BLOXBGBS". I can probably make the comparison case-insensitive, as the game doesn't care about case anyway. The reason why previous version of editor did not give error message is, that it simply silently ignored the problem and the tileset, which was previously loaded, was used (the editor loaded BLOXBGBS upon start by default). but also if a tileset don't ever exist maybe would be good to load the default BLOXBGBS just as a failsafe (just as happen on all the previous versions). Well, if I use BLOXBGBS as default tileset, then the maps using custom tileset won't display correctly anyway, so I conider this failsafe method to be rather useless, it rather encourages the user to get the tileset they needed. I cannot see a thing there, and the more you move around it's worse. At least I still can use the BLOXBGBS to check which buildings have each faction and where every scripting part goes and even move them around if I want to; I can even fix any problem this map have with the scripting part without having the tileset myself. The only reason I mention BLOXBGSB it's because it's the one used as default when creating a new map. 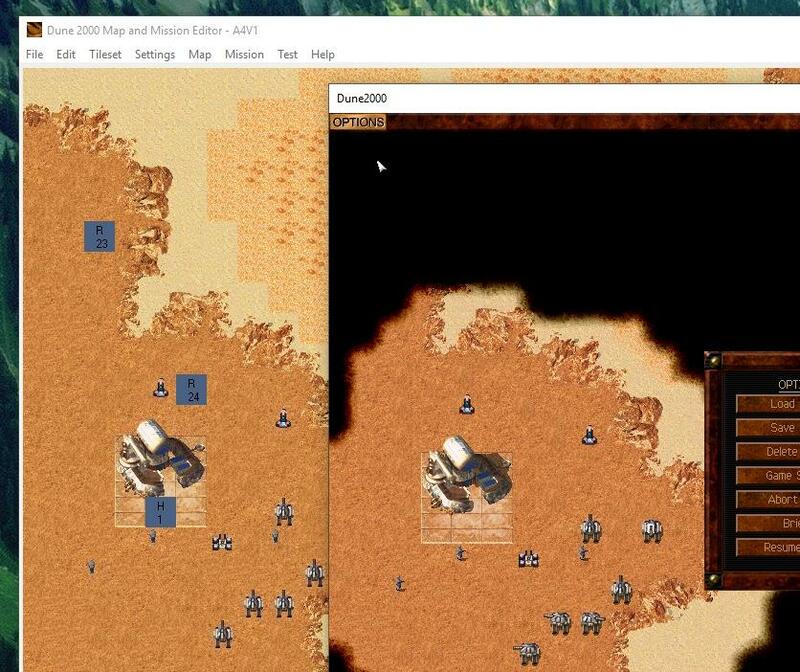 Myself, when I was fixing the Luminar's Fremen campaign, he features a "night mission" with a custom tileset. I had no idea what that tileset was about since I never reach that far; also I had no idea what was about r16 and stuff like that. Opening his map with 1 of your earliests version the editor load it withouth any trouble, he assigned BLOXBGSB; some tiles were wrong but at least I could fix the location and scripting part. Swapping Fremen with wathever faction he was using instead. And yes, I know you can just simply choose a random tileset to change the graphical glitches, but for the POV of a newcomer opening a map that makes use of a custom tileset, I think looking into a map with tiles out of place or weird looking it's less scary than seeing a bunch of graphical glitches, which may look that the editor it's broken even before they realize what a "tileset" is. Fair explanation. I will load BLOXBGBS (the default tileset) when a map uses unknown custom tileset. I'm probably doing something wrong, but when I load (as example) the map MO8V1.MAP and do a quick launch I start as mercenaries. It should be Ordos. If I do Test>Launch with settings and select play as on Ordos.... I'm not really in control and the computer starts building. Cm_blast, see below, spotted my mistake. Ignore this post. I'm probably doing something wrong, but when I load (as example) the map MO8V1.MAP and do a quick launch I start as mercenaries. It should be Ordos. If I do Test>Launch with settings and select play as on Ordos.... I'm not really in control and the computer starts buildin﻿g. MO8v1 it's a Mercenaries map. It's just the original O8v1 map but the authoer changed the ownership to be played as Mercenaries instead Ordos, and the Ordos were given a practice type of AI. any other scripting it's untouched. So in this case there is nothing wrong, that map it's played the way it's suppose to be. There is other called "Co-Op 2P 3AI Ordos Mission 8 ported by Feda" on the "maps" folder mean to be played on multiplayer; it's the original O8v1 map but here both Ordos and Merc (swapped as Atr/Hark) are playable by humans (you will reconize because the MCV spawns are all together and surrounded by a few turrets to kill them at the beggining). In shor. MO8v1 it's mean to play in single player mode (campaign style, not initial MCV spawns), while the "Co-op [...] ported by Feda" it's mean to play it in multiplayer game. Player 1 will be at the Ordos position and player 2 at the merc one (but you can play it as whatever house you want). I realize something about the custom the use of custom text.uib. The reason to use any it's to show on the missions some lines that cannot be edited with the editor, like the name of the units, for example. On my Tleilaxu campaign my units are called "Ghola trooper" instead just trooper, and the barrack it's rename as "Axlotl Tank". There was 1 guy that did something similar to change the "Atreides are hostile now!" predefined with other message. Your current editor, while using the "launch with settings" there is a box to add a custom text.uib; writing the name and testing the map will appear, but the map itself (not the testmap) don't save this setting; so maybe you can add an option or a box somewhere to be able to write my own text.uib (although this is not used too often, so don't need to be at first sight). Maybe on the this same windown, a mark next to the box; if marked, the text.uib written also apply to the current map; If unmarled, just don't use any but the default one. Also; I am wondering something: On the same windown (Launch with settings) there is a box with "parameters"; I guess it's to add special commandos to execute the dune 2000.exe. I don't know if the original game has any or funkyfresh/gruntmod added something by themselves; you know some info about this? Hey. I managed to create 3 new missions until another problem appeared. When I try to launch any mission, I get an error message (see Screenshot). The strangest thing is that I tried to run the same in another editor (I have two identical editors) - the error is the same. It is also interesting that two hours ago everything worked well. After that, I practically did nothing (I played only one game on cnсnet, apparently, it has some great significance). Help me please. Upd: this also happened when I just started the original game. Only black screen and this text. Hey. I managed to create 3 new missions until another problem appeared. When I try to launch any mission, I get an error message (see Screenshot). The strangest thing is that I tried to run the same in another editor (I have two identical editors) - the error is the same. It’s also interesting that two hours ago everything worked well. Afterwards, I practically did nothing (I only played the one game in the cnсnet, apparently this is of some great importance). Help please. Upd: it also happened when I just started the original game. Only black screen and this text. 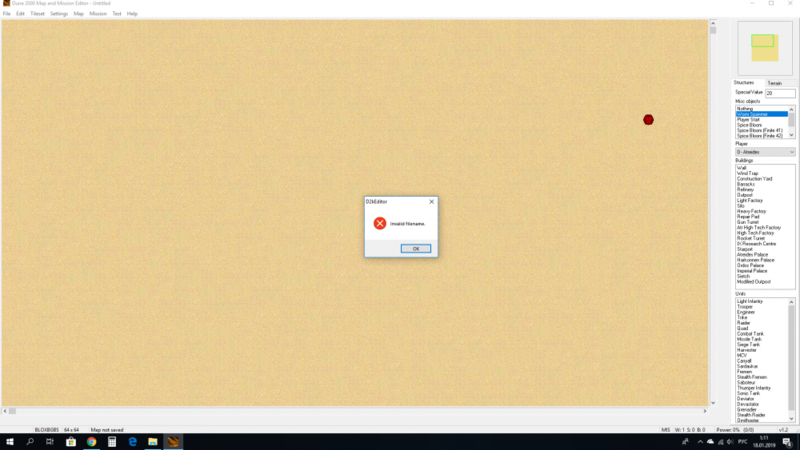 I have no idea, I only know that executing the cncnet5.exe usually update/download/overwrite some files on your Dune stuff (even I have a new folder called "shaders" that wasn't before I clicked it. You may try to execute the Dune 2000 config and try to mark/unmark a few options there, with a bit of luck that's enough to work. Ps: With a quick research on google "SetCooperativeLevel" it's related with DirectDraw; maybe executing your config can fix your problem. I just added this feature! I hopefully fixed that too. Hmm, I just wonder, whether this option is available in mission ini file (where mission name, author, briefing etc. is stored). What I mean, if the game will use the given TEXT.UIB file, when that mission is started from mission launcher. If the game doesn't support this option, then it would be useless, as this could be used only if map is launched from the editor, not from mission launcher. Maybe @FunkyFr3sh could answer that. Yeah, those are the commandline parameters passed to game executable (Dune2000.exe) when running it to launch a mission. I cannot recall if there are any useful parameters, I just added this for potential future use. Those fields are automatically updated when you change a tileset using Tileset menu. Otherwise, when you for example load a map with unknown tileset, the editor loads graphics for default tileset (BLOXBGBS) but those fields as well as tileset information in .MIS file will remain unchanged when you save the map. And tileset name is now case insensitive when opening a map. So, those are basically the last changes I made before I officially release a new version of the editor. You still have opportunity to spot any bugs or give some ideas for (not very difficult or complicated, rather simple) new features! I also have an idea to put the AI values manual (this: https://forum.dune2k.com/topic/27803-d2k-ai-manual/ ) into the editor .zip file which will get released, so that anyone who download and uses the editor have it easily on hand. What you think? Thanks. I change my mind lots of times adding or removing stuff, and sometimes I add several timers to makes some drops to appear at 4000, 7000 and 12.000 ticks. Later I realize I want another new at 10.000 and it's going to be nice to put it between the 7K and 12K ones. Thank you. This is what appears on the .ini on my maps on the tleilaxu campaign. The "Textuib" it's the only line that needs to be added manually on any map if I want to make use of a custom text.uib; and totally works with the Launcher, as long as the player have that file in the correct folder. Old modders (when the launcher wasn't ever a option) overwritted the original text.uib to showcase custom briefings on their campaigns; when I rearrange those maps to work on the mission launcher I couldn't know exactly what people edited, so just to be safe I pick up all those text.uib, give them a new name and use it as part of the game. The result: although my game it's in spanish if I play any of those old works, my game will be in english (only text); and never got a problem with that. For the record: after I played any map that makes use of a custom text.uib, later if I open your editor and use the "text with settings" your editor automatically show the name of the custom text.uib that the game loaded the last time. I never pointed at this because it's more my fault than your editors, and it's not exactly something big that annoy me or something, but since you are here may be a good time :P.
A screenshot of the way that windown looks. At the middle right, at the alliances part, "sandworms" it's cutted or on the "play as" the deploy arrow don't show up. I am currently using a 1024x768 resolution. If you can workaround/fix this with only a very small amount to work go for it, if not just leave it. This don't really bother me, so don't do too much extra work for a caveman like me that to this day still use that res. Just to point that the briefing part just fits ok in the middle, and don't seem like the text on the "TILEATR2" it's going to be cutted anyway, so I have no trouble using the key or scrolling the middle buttom instead clicking directly on the deploy arrow to select "smugglers". Just let me edit something, because Fey found recently how to make an AI to repair buildings and units if they are at X specific amount of HP instead the ~65% for buildings and 50% for units by default, if I am not wrong. Let met ask him for the confirmation so I edit the file for you to get. If you wish, you can also add this set of Ai's I pick up from the original game. The zip contain all the Ai's used on the final mission from the vanilla game. This include the multiple Ais you face as Atreides, Harkonnen and Ordos, even the Mercenaries that, on 1 map, have a 250.000 of unit build rate (they produce a unit every 2 hours) <-- the AI still produce units fast under attack, which they are often. Those vanilla Ais are really different between them: some takes plenty of time to attacks, others just attack like once per 2.5 minutes; some have 1 harv per ref, others 2, so overall those vanilla Ai's cover the most basic desires. I also included three generic templates AIs that I usually load as placeholder, called "aggresive, defensive, balanced" so can be used too. Also the 2 Ai used for practice games, one it's suppose to be the vanilla AI (expand base, train eengineers) and the other the one used on the C&C online AI games, which produce more factories, more harvs and have the faster production of units possible. So even if the modder have no idea, or it feels too overwhelming to edit that many AI values, importing an preexisted AI it's a good solution to start with. My zip has a excel with I think are the most basic info, just knowning when the AI attack the first time, how often he builds, how big it's the defense... just basic stuff; but maybe for the good of people that may not have a program to load that it could be transformed into a txt or something in between. I confirmed already for the AI manual and has been updated the file, so feel free to pick up it. Hey Klofkac 😮 Thanks again for the updates! I just spoke with Cm about the AI manual and I hear you're about to drop the final release, so I'm here again. Things look fine so far in the new thingy, at least I haven't found anything Cm hasn't reported already. Uhh... although I guess if you could provide the option to invert the grid color, that'd be great. Black works on Arrakis, but given the new tilesets and stuff around, white might be more visible against the dark platform. Maybe even red / cyan or something. And if it'd be possible to arrange certain tiles for easy selection (in the "block preset selection" menu in the editor rather than needing to go through the config file or something, that'd be tremendously convenient, I'm sure. If not, no problem, we'll work around it, but I'm just throwing it out there. Fixed: Set Attack Building Rate event: value is named "Arrack rate" instead of "Unknown"
Added: When temporary "TESTMAP.MAP" file is saved, the map name in ini file is renamed to "TESTMAP"
So in case everything is okay (please retest and confirm if there's not any serious flaw), I would like to ask for publish this into D2K+ site for official download (https://d2kplus.com/map-and-mission-editor/). I'm really happy I managed to do a new release after so many years! It has no significant new features, but I tried to fine-tune the program, make it better and supplement some small missing but useful features. I wanted to thank you for all your support and improvement ideas (even if I was not feeling like implementing some of them). I hope you will like the new version, and believe it won't miss anything really important now! Seems to work; I will tell when I use it more actively. I almost forgot I have those "anty-infantry" and "raw power" Ais. Since english it's not my first language I am not sure if the "campaign generic AI" said what I understand. That AI has a priority of 1,000, so will not focus only on the CY or windtraps as the vanillas-westwood Ais; however the player still will be the focus of the AIs, even if there are other Ai's present; What I mean with "focus" it's the "first order". The CPU just select the units ready to attack and click on an player building, only when on the move the CPU checks "there is other enemies near?" that may them to turn his focus, but his first "try" it's the player. The manual already tells people how to make an AI to "try" first against another AI instead the player. But overall; this "campaign generic AI" still will make Ai's to focus the player over other enemy AIs; may worth mentioned it. You may add an initial window to trigger the first time you open the editor (aka no .ini present) to help new guys. If I unzip the file, open the editor and go straigh into "new map"; the game starts with a "could not find image file for tileset BLOXBGBS" and the screen show a black screen, even If I change the tileset the error still triggers. Closing the editor and checking the "[paths]" section all it's empty except GamePath= GameExecutable= MissionsPath= TextUIBPath= (but not path written at all). However, if I use the "open map" option and load any map, the .ini update itself with all the good path, or at least looks like the good path, the game starts fine. <-- so maybe you may add a pop-up windown suggesting to open any preexisted map first to make the editor to understand all the path from the game automatically and then closing the editor. From that point the editor works as intended, but loading a preexisted map will help a lot to find all the pathing. So a pop-up or a readme with that info should be enough. 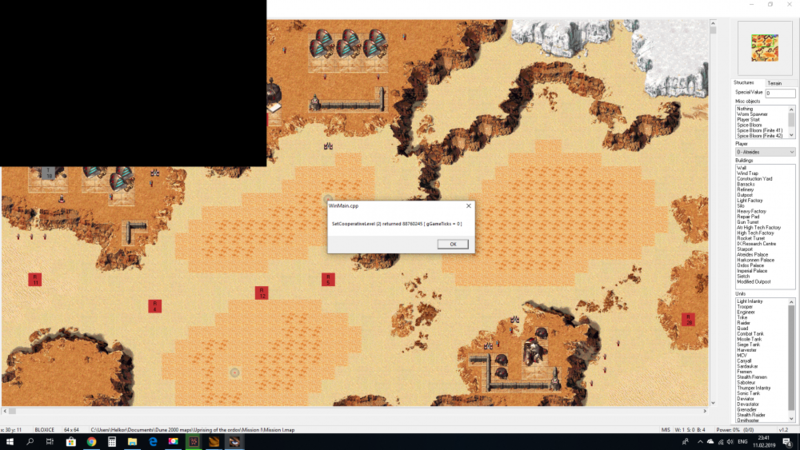 I had a minor problem because I manually moved the maps from the original gruntmods path to match the vanilla dune 2000 one (original it's "dune2000\mission" but in gruntmods it's "dune2000\data\mission"; your previous editor couldn't find the good path so I just moved everything). I guess if I use your editor it tries first on the "data\mission" and mess things with the TESTMAP that it's saved. But anyway; I changed the path and work as fine as it should be. so good work. - I created a BLOXHILN config file for the Heighliner tileset, and the tileset is properly loaded if I open a map with said tileset. - Moving a flag up and down results not only in the condition entry being changed, but the flag# = true/false parameter being changed too. This should mean there won't be any problems arising from it. - Not encountering any color errors when highlighting conditions. - I appreciate the drop-down box for music selection. - The text.uib entry in mission settings seems to work. - I noticed the scroll bar in units / structures is fixed now. - Grid color editing is perfect, thanks for that. So far, things seem to work. Guess I'll actually try editing with this and see if I find anything else that doesn't. Unless you've got something specific in mind that we should test.